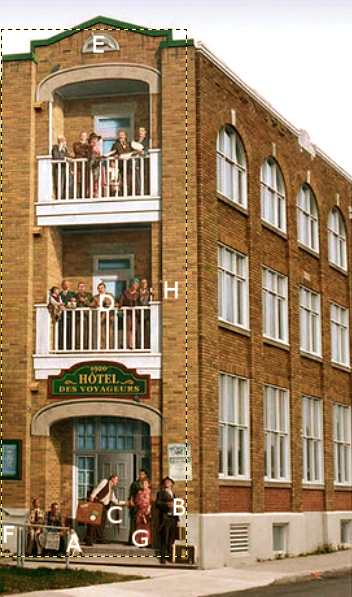 This mural pays homage to the former hotel district by showing in a symbolic way a former building, l’Hôtel des voyageurs (the Traveler’s Hostel). The first railway station was built in the downtown area in 1852. Facing the station as of 1877 was the Railway Hotel (the present location of the municipal parking lot), among others. 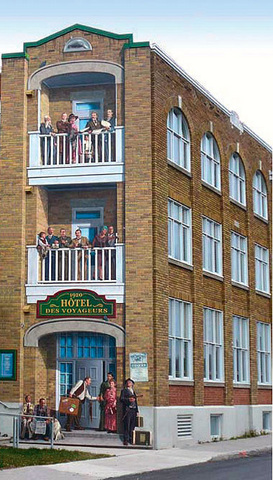 The real Hôtel des voyageurs was built on rue du Dépôt around 1910. The small and modest hotel was frequented by travelers waiting for their train connections. You can also see on this mural old-time downtown merchants from across the decades, waiting for the arrival by train of their local boxing champion Léonard Dumoulin, alias Jack Renault.